Unit 28 Lot 68; TOT ID# 1609. This comfortable two bedroom two bath ocean meadow home is a quick five minute walk to Walk on Beach. Relax on the deck or soak in the hot tub while enjoying the blue water ocean view. This home welcomes your dog, has an open floor plan and is nicely furnished. Master bathroom has an oversized jacuzzi bathtub also. For your convenience, free wireless internet is available at the house. Bed linens and towels are not included with this rental. We have stayed at Cunningham previously. It has its quirks (a jacuzzi and not a shower in the master bath? ), but it's location, proximity to our daughter's rental, and it takes digs, makes it a good rental for us. The property deserves some updating. Everything was perfect. The wood burning stove was especially nice on rainy days. We had a wonderful family Thanksgiving. This was the perfect place for us to stay with our toddler and 2 dogs. There were no stairs indoors for her to fall down. The beach was about a 5-minute walk away and was quiet. On one of our beach trips, we were the only ones there. We ordered meals through Plated and the box was there on our arrival. Kitchen was well-equipped for our meals. The house was very clean and the property management service was efficient and helpful. We would definitely stay again. In Anchor harbor. Shopping in Gualala. Thank you for sharing this rental with us. See you soon. I've stayed at Cunningham on previous occasions and have always enjoyed my stay. 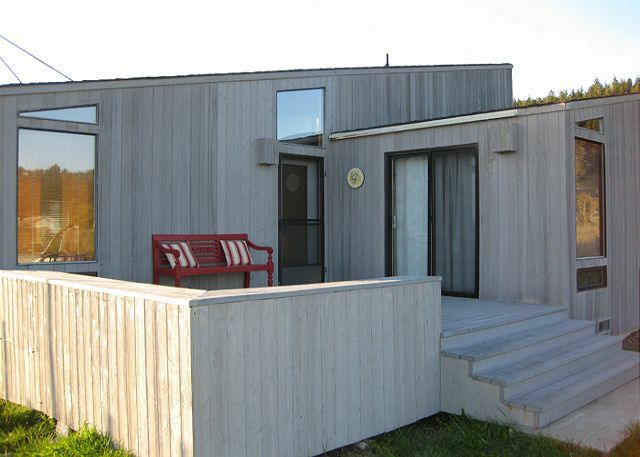 The house is perfectly situated, has an ocean view, and requires only a short walk to Walk On Beach. The rooms are very comfortable, and the kitchen has every needed for an enjoyable night in. The hot tub and wood stove are great bonuses! We were greeted each sunset by deer and a family of quail in our front yard, and had a flock of sheep nearby. Restaurants, such as St. Orres and Black Point Grill, are a short drive away, as well as other public access beaches. Staying a Cunningham is a very relaxing and enjoyable experience. Nice location, pet friendly, clean and quiet. My girlfriend and I had a terrific time staying at the Cunningham in Sea Ranch. The house was beautiful, clean, and comfortable. We love cooking and really appreciated the fully equipped kitchen. After a long day of hiking or walking along the beach, it was really nice to sit in the hot tub or make a fire in the wood burning stove. Check in and check out was very easy. I couldn't be happier with the experience. Having gone through the devastating fire in Santa Rosa (our home made it through), we decided to come to Sea Ranch for some R&R. Cunningham house was a great respite. Small and cozy with a hot tub and fire place. Trails began right out the front door. We love the Cunningham! Stayed there last year too & will definitely be returning. This is my favorite Sea Ranch rental. It's cozy, well-stocked, with all of the comforts of home. The house is minutes away from the beach and close to town. I'll be back for sure. Thank you for another wonderful stay. Always so peaceful and relaxing at this house. Wish we could stay longer. Enjoyed our stay at this rental. Noticed they redid the one bathroom-it is lovely!!. However other bathroom transports you to the 70's! We enjoyed our peaceful stay here. Our friend uses a walker so this two bedroom place nicely accommodated her needs. WE enjoyed our stay at Cunningham very much. Stocked kitchen, great hot tub, clean! !, comfy beds, pets felt very welcome!, would rec a good door mat at doors indoor and out. This is our favorite Sea Ranch rental to stay with our dogs. The house is cozy and a convenient short walk to the beach. The home is well stocked with cooking supplies, which is helpful given the limited eateries. This is our 5th stay at this home and we consider it our home away from home. We'll be back soon. We spent our first anniversary at the Cunningham & it was absolutely perfect! Hiked in the meadow & forest with the pup, spent some lovely time at the beach, had dinner at the Lodge(Black Point Grill) & just enjoyed the long holiday weekend together. The house is very comfortable, well stocked and you can't beat the location. We will definitely be returning in the future. We loved the layout, walk-to-beach location, the hot tub and whirlpool bath - both for two people, and the fact that the house was very clean and uncluttered. As others have pointed out, could use more comfortable reading spots - both inside and outside. The kitchen was well supplied and, except for the electric stove which had some issues, everything worked. There is a house close by on one side which was empty when we were there which was a big plus. Great place for our family and pet, short walk to a nice people and dog beach (as some beaches are more for seals) and close to the newer and lovely Del Mar Center pool facility. We hope to return and stay here again! It was a wonderful weekend with my mom and brother. We always stay in the same house and it was great as always. The bathroom remodel was a nice surprise. Back again for 12 days. This is our home away from home. We'll be back again next year for sure. The home is cozy and close to the beach. Beach Rentals is a great agency-highly recommend. This house was perfect for my wife and I and our 2 dogs. The beach is a very easy walk there and the area is very quiet. The house was wonderful. We will definitely be returning. We absolutely loved our stay in this home :) it was mine and my boyfriends first vacation together and we will definitely be back. We've been coming up to Sea Ranch for over 25 years. Beach Rentals is by far the best agency to rent from. The staff is courteous and very accommodating. Cunningham is a cozy, well equipped little house located minutes from the beach. We are already scheduling our visit for the fall! Enjoyed our stay. Since our cell phones don't work here wireless internet was a big plus. seeing seals birthing and deer in the backyard was very pleasant. Fantastic, clean,great walking distance to beautiful beach. Rental agency/staff were delightful. I would certainly rent this home again. Excellent location, beutiful rental, well stocked and homey. Excellent. Perfect location and layout. Easy access to beach. All the amenities, well stocked kitchen and cozy. Dog friendly a big plus! Love this little house and the hospitality of Beach Rentals. We've been renting up here for years and Beach Rentals is by far the best! Can't wait to come back in the Summer. Wonderful 2 bedroom, 2 bath home. Dog friendly. Excellent access to bluffs for walking miles and miles. Just very close to a next door rental, larger home, but the guests were quiet the weekend we were there so no problem. We had a great time in sea ranch. The house was located a short walk to the beach, good trails and access. Out two dogs, Rosie and Jack, enjoyed there walks and relaxing around the house. They liked the doggie care package of towels and cookies also. We also enjoyed the quiet, peaceful surroundings of the neighborhood with wildlife and great scenery. The restaurants in town were good as was the lodge. It's a great location for day trips to other towns on the coast and exploring local architecture and unique locations. I usually stay oceanside which this house was not however it was a very easy walk to the ocean - great location near beaches and marine preserve for viewing the seals, everything in the house in good working order, comfy beds- nice place for 2-4 people I would rent it again! Great stay. Hot tub, dog friendly, quick stroll to beach, deer in neighborhood, comfy beds, nicely functioning appliances. Once the sink stopper in front bathroom is fixed so it will drain quickly, it will be perfect. Had great dinner at Sea Ranch Lodge and great lunch at café in Gaulala. Surf Market is very good with nice selections. We enjoyed our stay at this little house. Comfortable, lots of windows and a decent view of the ocean. It was a little 'worn around the edges' (example: broken window shades) and a few cobwebs in the corners, but our family (5 adults, 1 toddler, 1 baby, 1 dog) enjoyed our time there. It's within close proximity to Walk On beach, so it's easy to wander down to the beach without much effort. A few things to know: Close to other houses - not a lot of yard between the houses on either side of it. It's also in the meadow - no wooded area around it, but there's an umbrella to help with shade outdoors on the patio. I could have used a few more 'lounging' couches. Note - there are 2 bathrooms, but only one has a shower/bath, the other has just a jacuzzi bath. Great value for the price. Had a great time in sea ranch as always! It's been about 12 years since the family has been but it's just like we remember. Can't wait to start our annual trip up again. Beach Rentals exceeded my expectations. I have been renting at Sea Ranch for 18 years and this is the best experience I have ever had. The staff know how to make two-legged and four-legged guests feel welcome. Thank you again for a wonderful experience. We'll be back soon. Close to town, so shopping was close not so time consuming. Close to walk on beach. No real privacy curtains. Appliances new, kitchen a little old. Facilities were nice and clean, plenty of room for two to four. Only problem was the adjavent house was really close and booked with a large group of folks, they were not rowdy, but with the translucent window shades, not too much privacy, especially in the evening.Other than that, had a great time and plenty of rest! You can also leave the key in the house after you leave and lock up on the last day without having to drive back to town. Will use Beach a Rentals again! Beautiful location, very close walking distance to the ocean, and nearby walking paths. Got to see the mother seals laying along the beach, many of whom had just given birth within the last few days. Wonderful, April weather, clear and sunny. Great place to just get away from it all ! We will definitely go back to Sea Ranch again this year. We loved the location and the house was nicely decorated and clean and comfortable. We would rent it again. This house was great for 4 people and 2 dogs. Close to the beach and Gualala. Great place - will come back for sure! Cozy, clean and great location - a nice walk to the beach, and a short drive to town for food, supplies, etc... Nothing fancy, but that was what we were after. Nice home in a great location , easy walk to bluff trail and beach, sunny deck for relaxing in the spa. Lovely views for a little watercolor painting, warm wood stove for snuggling. Best of all our dog could join us, a nice bundle of a sheet , towel and treat was waiting for her. Needed only one thing a non stick pan.. Bring your own. Lighting for reading could be easily improved in 2nd bedrm, the dishwasher is loud and the tv/dvd is pretty complicated but the layout in the house is nice and the deck is very pleasant, really nice new bathroom. 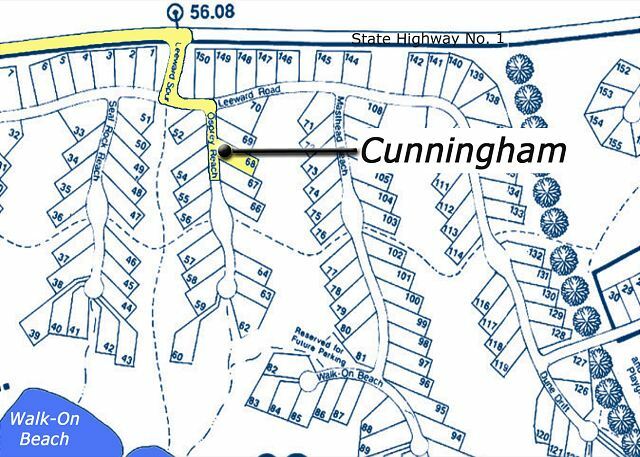 Cunningham is comfortable, in a great location to beaches, trails, and recreation center. My young sons and I had a wonderful time. It's an older property with older appliances and furniture but was good value for the money.Short walk to Walk On Beach and the beach trail system.Being pet friendly was another major advantage as was fairly slow but reliable internet access.We would definitely return. We had a peaceful and quiet weekend away. Loved the hot tub under the stars and the quick walk to the beach (5 minutes along a pretty path). Other reviews recommended bringing our own non stick pans for cooking and this was a good tip. Other than that everything was pretty much perfect. Another great week at the Cunningham house! We love staying at this house and try to make this an annual trip for our family! Thanks for everything! We have stayed at Sea Ranch many times over the years. We have rented homes from each of the local agencies, and we feel that Beach Rentals is the best. When we entered the house, it was neat and clean; they even left a towel and blanket for our dog with a treat attached. They had delivered flowers that my husband had requested for our anniversary. We went on several walks and were once again awe struck by the beauty of the ocean. We had an incredible time. We greatly enjoyed our stay at the Cunningham home in Sea Ranch. Good location. Cozy home that was nicely furnished. All was very comfortable and clean. There didn't seem to be any non-stick frying pan which made a problem for the pancakes, but otherwise all was good. A Home away from Home--Only Better! Cunningham was a wonderful getaway for us, our two grown daughters, and our toy poodle. It's just the right size for a cozy family experience. The open layout is perfect for games, movies, reading, listening to music, computer surfing, guitar playing, family meals...The hot tub is great for star-gazing; the night sky at Sea Ranch is glorious. It's an easy walk from Cunningham to Walk On Beach. We'll definitely be back! Ran out of time to do everything we wanted. Just a heads-up: the washing machine and the dishwasher are very noisy, so just start them when you're going to leave the house for a while. The house was very inviting and relaxing. Great location. Easy walk to Walk On beach!! One of the best beaches on The Sea Ranch!! And the best part is that The Cunningham house allows dogs so we were able to bring our black lab Jack!! We will definitely rent the house again. My wife and I stayed in Cunningham for two nights and had an absolutely great, relaxing weekend. The location is ideal; just a few minutes, and you're at walk-on beach or strolling along one of the bluff trails. It's also close to Gualala, which is a bonus. Our only complaint with Cunningham is a general feeling that some amenities feel dated (e.g., kitchen w/ electric stove, shower). Aside from that minor quibble, Cunningham is a terrific place to stay for a weekend getaway. We loved this beautiful house right near Walk-On Beach. Wonderful view, easy access to beach and trails, not far from Gualala - all just right for our honeymoon. And our dog had a great time too! We stay at the Cunningham every year. This year there was some new furniture added which made it even better. Clean, great location. We had a wonderful, relaxing visit, and we will be back as soon as we can! Every room in the house has a clear view down to the ocean, even though this isn't a beach fron property. The house was perfect for a small family. The beds are comfortable and the house is clean. The house hasn't been updated, so the kitchen is far from amazing, still we had a great time cooking and would definitely rent the house again. The price is right on this rental. I have rented from all of the rental companies. Beach Rentals staff is the best and I will continue renting from Beach Rental. We stayed at the Cunningham house the week of my birthday and had an absolutely perfect time. It was a rainy weekend with lots of wind so sitting by the woodburning stove with the fantastic whitewater view was wonderfully cozy after walking the bluffs and beach in the rain. The surf was amazing and we saw so much wildlife - seals, dear, all kinds of birds. Peaceful, beautiful, and a great place to get away from everything. The house was so comfortable and light had a great floor plan for two couples and a baby and the hot tub was lovely. We would definitely stay at this house again on our next visit to Sea Ranch. Cozy, clean house with a great woodstove and even more in the kitchen than promised. The time was short but wonderful for our family's stay - and thank you so very much for allowing dogs. Your welcome gift of a sheet, towel and doggie biscuit was a big hit! Thank you!!! The Cunningham provided an excellent place for a long weekend relaxing retreat. The house is cheery, sunny and open with a nice size kitchen and great room as well as two comfortable bedrooms. The location is great - a very short walk to the paths and beach access, plus close to town. We loved the Cunningham house. It worked very well for our family - two grown sons and one dog. The wood stove was nice and cozy on a rainy winter day. I don't want to name the house which was comfortably and amply endowed because we want to regularly visit and don't want to give it too much publicity, but all aspects including the price were decidedly attractive. We'll be back! We have stayed in this house for 5 yrs in a row. We only book our mother daughter trip when this house is available. I recommend it highly. We loved it! The Cunningham was the perfect size, location was great, very private. We will definitely be back! Cunningham seemed very well-designed to us. Very comfortable, spacious, workable. Nice light and views, nice location. Everything worked.